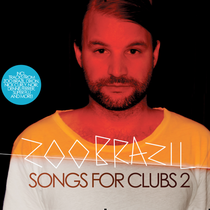 After the success of the first ‘Songs For Clubs’ in 2011, Zoo Brazil gets set to release ‘Songs For Clubs 2’ on Songbird, featuring some great house music and beat blended into a 70-minute mix. The compilation features tracks by Zoo Brazil himself, as well as Roger Sanchez featuring GTO, Josh Butler, Nick Curly, Noir, Cascandy, Juan Kidd & Josh Demello, Dennis Ferrer and more. Zoo Brazil’s ‘Ground’ kicks off the mix, which includes his collaborations with Ursula Rucker and Philip which were remixed by Santé and Sasse respectively. Zoo Brazil, also known as John Andersson, started producing and writing music at an early age and has released more than 140 singles and nine albums in his career so far. He is currently remixing for Lana Del Ray, Moby, Tiësto, Inflames, Steve Angelo, Zombie Nation, Fatboy Slim, Danni Minogue, James Holden and many more. It’s out 14 October.